Paladin Walk: Patrick, tell us what your doing at Air Force, and what led you to Colorado? I am an Assistant Offensive Line Coach for the Varsity but I am also the Junior Varsity Off. Coordinator/Off. Line Coach. Basically I am Coach Hendrix's assistant. At Air Force we have a J.V. team that normally consists of freshman and some sophomores. We play a 5 to 6 game schedule against Junior Colleges and our own Prep School. We do not redshirt any of our freshman so instead we give them a chance for some playing time. I was working at Coastal Carolina this past season with a great staff. I was an Assistant Strength Coach and had a great time working with all the players in the weight room. But I had a strong desire to coach on the field and particularly o-line. Coach Hendrix accepted the job at Air Force this past off-season and I got a call from him a month or two later. This position came open and since I was still very familiar with Coach Hendrix's terminology having played for him for four years I had a pretty good shot at the job. I can't imagine a greater opportunity then to work at a place with a great winning tradition while doing what I love to do. Paladin Walk: Is coaching going to be a career for Patrick Covington? And do you think we might see you coaching for the Paladins in the future? I hope I can make a career of coaching. I think I have the greatest job in the world. I get to spend time with high quality people in an enthusiastic environment where everyone is striving towards the same goal. I love going to work everyday. I really can't imagine myself having as much fun doing anything else. I would love to coach at Furman one day. Having played at FU I know what a great place it is. If that opportunity would arise I would definitely jump on it. Paladin Walk: You were a helluva consistent player for Furman, the one play that sticks out is seeing you run 60 yards to chase down the Appalachian defender to save a touchdown in the 2005 playoff game. What was running through your mind? And on a good note, what’s your favorite memory as a Paladin? Ha. I never thought my last play would be a tackle. Believe it or not I thought I was going to strip that ball and make something happen. I felt like I was running as fast as I could until I saw how slow I looked on film. 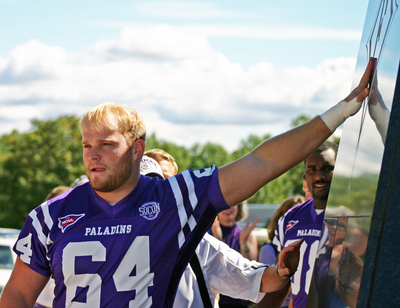 There are so many great memories on and off the field from my experience as a Paladin. On the field would have to be when we beat App. State in the regular season of my senior year. I just remember what an emotional game that was for all of us. They had managed to beat us the prior years in close games where they could have gone either way. Off the field there are so many great memories I can't list them all. Being around the guys on the team and going to eat at the Ham House or Stax together. Stuff like that is what you remember the most. The lasting relationships that I developed with my teammates. Paladin Walk: Did you ever have a favorite play or formation at Furman? It would have to be our short yardage/goal line play that everyone has seen a million times because Jerome Felton usually scored on that play. The quick hitter to the fullback with the playside guard pulling. You just always knew we were going to gain yardage. Paladin Walk: Your dad Dwight was responsible for getting the Paladin Walk started on gameday. What did the walk mean to you as a player? You know I wish we had that all 4 years I was there. I think it added even more tradition to the game day experience at Paladin Stadium. I think it also put a spotlight on the Statue. Paladin Walk: Clay Hendrix has built many quality offensive lines at Furman. What did you learn from Clay as a player that helps you now as a coach? I was very fortunate to play for Coach Hendrix. He taught us to play with consistency and have an understanding that if everyone does their job we were always going to be successful. More importantly he always treats every one of his players equally and with respect. Paladin Walk: What is the most important characteristic a football player needs to have to have the type of success that you enjoyed at Furman? Every player that is recruited to come to FU has the skills to become a solid college football player. I think what you see in the guys that succeed is their ability to become great team players. Guys that I played with like Rodney Johnson, Billy Napier, Corey Stewart, and many more that you saw excel on the field were the ones leading by example and pushing people to buy into the goals we set as team. Paladin Walk: What do you think about the current crop of Paladins manning the offensive line? I think there are a couple of young guys there that are physically a lot more talented than I was. I think in the past season many of those young guys got a lot of game time experience which will only add to the depth for the 2007 season. They had some good senior mentors in Adi and John, and that will help immensely. Paladin Walk: Now for some serious questions. Xbox 360, PlayStation 3 or Wii? I had a Playstation 2 in college but haven't played it in awhile. Paladin Walk: What’s one thing about Patrick Covington that would surprise Furman fans? You know I really don't know. Probably that, before I committed to FU my senior of high school I was really close to committing to App. State. They were the first to offer me. I'm still glad I didn't. Patrick thanks for taking the time to answer some questions and good luck this season with the Falcons. 1) Dwight you’re a parent of a former Furman Football player can you put in a few words what the experience was like for you as a parent? Thrilling. To have a son play for and attend one of the leading liberal arts universities in the country could not have been a better experience for him or us. The most important part was that his coaches told Patrick the truth everyday. They didn't play games with him, but let him know where he stood and what he needed to do to get better. Clay Hendrix turned him into the player we knew he could be and did it in a quality way. We are so glad he is coaching with Clay now at the Air Force Academy. And Patrick has a Furman degree. Our relationships with the other player parents are also very special. We tailgated together, traveled to away games and stayed in the same hotels because we enjoyed each others company and loved talking football. We formed the Furman Football Parents Association to help promote greater unity, to make sure all the parents were included in what was going on and to take advantage of hotel discounts we could negotiate by traveling as a group. 2) How did you get from a player parent to a Furman employee in charge of athletic ticket sales? It all started when I first met Dr. Shi right after the football banquet in 2004. In our conversation I thanked him for the great experience Patrick was enjoying at Furman and that I thought he was the most fortunate guy in the world to work and lead such a great and beautiful institution as Furman. Right then, (as if on cue) Anne Fambrough comes up and puts he arms around both of us and looks Dr. Shi right in the eye and says, "You need to hire this guy!" I was shocked by this, but Dr. Shi said let's talk. It had never occurred to me to pursue a job at Furman and I thought that was the end of it. The parents met after the banquet and the Football Parents Association and the Paladin Walk was born. We did the Freshman Football Rouser at the spring game for the next two springs to welcome the new recruits and their parents to the Furman family and I MC’ed this event that included Dr. Gary Clark and Dr. Shi. In the fall of 2005 I received an email from Dr. Clark saying that he and Dr. Shi were creating the position of Athletic Ticket Sales Coordinator and would I be interested? I could not dial the phone fast enough. I had always wanted to work for a college, but to be able to sell Furman Athletics and Furman University. I still have the copy of the email. I can't wait to get to campus in the morning and I hate to leave at night. 3) Can you tell us some of the ticket initiatives for 2007? And what are some new things we can look forward to Game day? On www.furmanpaladins.com main page you will see the button for the Furman Elementary and Middle School Initiative. We are selling season tickets in our east stands for $50 and if the buyer designates a elementary or middle school on the form we will donate 30% of the purchase price to that school. I have spoken and visited with several PTA presidents who are promoting this to their parents. This is a win-win for Furman and the schools. http://furmanpaladins.cstv.com/fanzone/2007allaccess.html We will revive a grand tradition on August 18 at Pump up the Purple Fan Appreciation Day. Make sure you invite your friends to join us. 4) Your son Patrick was an All-American offensive lineman for Furman. What’s going on with Patrick and his new job with Air Force? He is recruiting in Portland, Oregon as I type this. He will spend the week there then fly back to Colorado Springs for the weekend then fly to Boise on Sunday to recruit for two days then to Utah until Friday when he will travel to Palo Alto for the Stanford/Nike combine. He spent last weekend at Purdue evaluating players at that Nike combine. Join the Air Force coaching staff and see the world. He is having a great time and he has been learning a lot. He is meeting high school coaches that have been in coaching for 20 plus years and they see how young he is and wonder what in the world they are doing talking to this kid they would have been coaching just a few years ago. 5) What can a Furman fan do to help you get people in the seats? Invite friends to the games. Use Pump up the Purple Day on August 18 to bring your friends to Furman. Word of mouth and referrals about your great experience of watching a football team that is in the hunt year in and out for a national championship is the most compelling. We will also have slideshows on www.furmanpaladins.com about game day experiences that fans can send as links to their friends. We have one of the best athletic programs in the country and we don't back down from anyone. We should thump our chests and talk it up when we beat Clemson in baseball and the girl's softball team comes from 7th seed to win the SoCon Tournament and a spot in the NCAA field. And at the same time the NCAA has honored seven Furman University athletic teams with public recognition awards for their latest Academic Progress Rate (APR) scores. What a great combination of academics and athletics! Best thing you can do is invite them to your tailgate and the games and talk about how proud you are of Furman. And I know our fans do it! The bonus question: Who do you think will be the surprise player for the 2007 football season? I think how well we can run the ball. Not a surprise, but somewhat of an unknown to the average fan is Tharry Salley. Hard hitting, hard running FB/RB who will be in the mix as the Paladins are pretty deep at running back. Man, he can hit and does not mind running over people. Mike Brown will have a chance to show what he can do at tailback also. Sets up his blockers and waits for the hole to open then has the burst of speed to take advantage of the opening. And I am talking about three deep here for the surprise players. On the defensive side of the ball will be the Twitty Brothers. They both like to hit and play from the ground up. I thought they had a good spring and will get their share of playing time this fall.